Almost 10 years later the first full length album is finally released… have a go at it before it withdraws. The plugin that we saw as a joke has proven itself to be one of the most useful plugins we ever made. Bipro 2.0 provide you with all the mastering tools you need to control frequencies below 50Hz (except perhaps a limiter). It’s best used before any type of compression or limiting while mastering but as usual with audio, use it where you think it sounds the best. It can both be as transparent as it gets or leave both pleasant and unpleasant artifacts when pushed hard. We built it to work best at moderate settings but can be amazing as a sculpting tool to add punsch or add phase shifting artifacts into the mix. Our popular mastering EQ, Chokidar, gets an extra band (Low Mid) and lots of under the hood improvements, AND, we ditch the limited free version and give away version 1.0 FOR FREE!!! 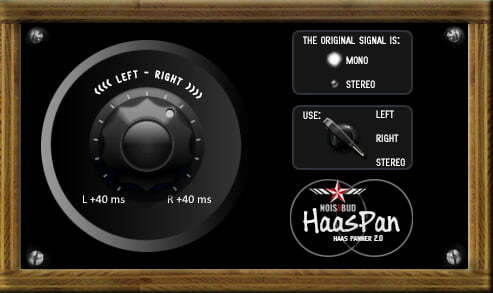 HaasPan gets the ability to pan stereo sources with the Haas technique, you can also choose to use just the left, right or both channels/stereo…. One of our songs are being used in Saintpid Masterings loudness experiment LUFS. Read more about the project and listen to all 20 versions of our track “Truck Driver”!